Class 2 visited RHS Rosemoor. 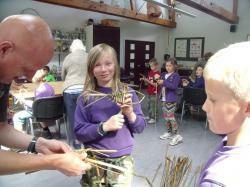 During the morning the children learnt how to make string from flax. It was very, very strong! Afterwards, the children learnt how to weave rushes into fish. The rushes had to be wet so that they would bend easily. The children had a go at making natural dyes using vegetables and plants which was fascinating. They learnt that the Romans and other invaders would have used the same method to dye their clothes.